Moorfields Eye Hospital NHS Foundation Trust is delighted that Professor Peng Tee Khaw, our director of research and development and one of our leading eye doctors and researchers, has been awarded a knighthood for services to ophthalmology in the Queen’s Birthday Honours. Professor Khaw, who specialises in glaucoma surgery both for paediatric and complex adult cases, joined Moorfields and our research partners at the UCL Institute of Ophthalmology in 1987. He was appointed as a consultant in 1993 and as a professor in 1998. His distinguished career spans the fields of medicine and clinical research and is reflected in the breadth of clinical, academic and director roles he holds. 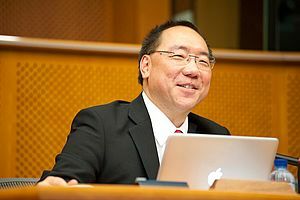 In addition to his role at Moorfields and the Institute, Professor Khaw is the director of the National Institute for Health Research Biomedical Research Centre based at Moorfields and the Institute, and director of the eyes and vision theme of UCL Partners, one of the UK's first accredited academic health science centres and now one of its first academic health science networks. Until May 2013, he was also president of the Association for Research in Vision and Ophthalmology (ARVO), the world's largest eye and vision research organisation, the first UK-based president in the association's 85-year history. Commenting on his award Professor Khaw said:"I am very humbled to have been awarded this incredible honour. I feel I have received this on behalf of all my colleagues here at Moorfields, UCL and around the world with whom I have been privileged to work, and who transform the lives of so many people every day." Moorfields' chief executive John Pelly added: "The award of a knighthood to Professor Khaw is thoroughly well deserved. He is, without doubt, one of the foremost ophthalmologists and clinical scientists of his generation and is enormously respected by colleagues and patients alike. I am thrilled that he has been recognised in this way, and warmly congratulate him on behalf of everyone at Moorfields." Professor Khaw's long track record of innovative research includes developing new therapies, particularly for scarring following glaucoma surgery. He has developed surgical techniques which have markedly improved the safety and outcome of glaucoma surgery, and developed new anti-scarring treatments based on laboratory research leading to large international clinical trials and use. These treatments and techniques have been successfully adapted for use in many parts of the developing world at minimal cost. He and his team have been awarded over 20 national and international prizes. Professor Khaw trained in both general medicine and ophthalmology at Southampton University. After completing his surgical training, he did a PhD in cell and molecular biology of ocular wound healing at the UCL Institute of Ophthalmology and University of Florida, USA. He treats complex adult patients and children with glaucoma, receiving patients from all over the United Kingdom, Europe and other parts of the world. In 2012, he was named as one of Britain's best children's doctors in The Times Top Children's Doctors list. He has given more than 20 named lectures and has published over 350 academic papers, chapters and books, as well as raising more than £80 million for research programmes and new clinical facilities. Peng Tee Khaw is Professor of Glaucoma and Ocular Healing at the UCL Institute of Ophthalmology and Consultant Ophthalmic Surgeon at Moorfields Eye Hospital, London UK. He is also Director of the National Institute for Health Research Specialist Biomedical Research Centre in Ophthalmology at Moorfields Eye Hospital and UCL Institute of Ophthalmology; Director of Research and Development at Moorfields Eye Hospital; President of the Association for Vision Research in Ophthalmology and the UK Paediatric Glaucoma Society; and an NIHR Senior Investigator. Professor Sir Peng Khaw has delivered 20 named lectures, won numerous awards including the first international ARVO Pfizer Translational Medicine Prize. He has raised grants of over £80 million, including funding for the world's largest Children's Eye Hospital and translational research clinical centre, and was knighted in the Queen's Birthday Honours for 2013 for his services to ophthalmology. He passionately believes that scientific research will enable us to achieve new and better treatments to changes lives for the better. Professor Sir Peng Khaw's laboratory group carry out research into the basic biology of healing, with a view to developing new treatments for the prevention of scarring and regeneration of tissues after ocular surgery and disease. They have designed specific single applications of intra-operative antimetabolites, which has led to the "More Flow regimen" and long term clinical trials in UK, the Far East and Africa. These trials have shown prospectively for the first time that progression after field and disc change can be almost completely stopped by the control of scarring and maximal pressure lowering. He has developed the 'Moorfields Safer Surgery System'. The change in surgical technique of antimetabolite application has led to a dramatic reduction in antimetabolite bleb related complications (>75% reduction in blebitis and endophthalmitis) and has been widely adopted around the world. He has continued to refine surgical techniques introducing new techniques such as the 'adjustable' suture to titrate intraocular safely downwards. A recent Moorfields trial has also shown a significant reduction in postoperative retinal scarring after detachment surgery (the first trial in the world to show this). They are also developing further improved surgical techniques for glaucoma surgery, and new anti-scarring treatments based on modern biotechnology. They have discovered a new treatment in the form of MMP enzyme modulation with small molecules for the prevention of scarring in the cornea, conjunctiva, lens capsule and the retina in the eye, and in other parts of the body. Based on a proposal for commercial development, they won the UK Simfonec Business Plan challenge and are developing this treatment for human use with one of the first UK Medical Research Council Developmental Pathway Translational Awards. They have also begun to popularise the concept that the prevention of fibrosis may open the door to regeneration in the human body. His group has also begun research into stem cells and have recently discovered a new line of multipotent stem cells in the adult retina that can de-differentiate into various cells of the retina and help maintain vision in a model of retinal blindness. They are also working on an exciting new project to regenerate the optic nerve. Professor Sir Peng Khaw has helped raise research and infrastructure grants of over £80 million, including the new £20 million Moorfields International Children's Eye Centre, for which he was the main clinical fundraiser, and the new £10 million Henry Wellcome Building for novel ophthalmic treatments at the UCL Institute of Ophthalmology. He headed the application for and is the director of the NIHR Biomedical Research Centre in Ophthalmology, which includes a new Translational Research Clinical Centre (TRACC) to 'fast track' new clinical therapies. Professor Sir Peng Khaw passionately believes that scientific research will enable us to achieve new and better treatments to prevent ocular scarring, and to ultimately promote regeneration of tissues to prevent and treat blindness around the world.